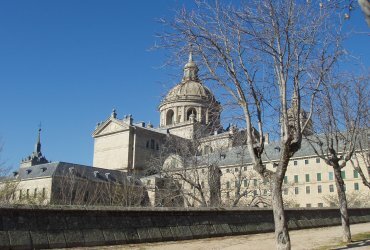 Escurial or El Escorial is an immense palace, monastery, museum, and library complex located at San Lorenzo de El Escorial (also San Lorenzo del Escorial), a town 45 kilometres northwest of Madrid in the autonomous community of Madrid in Spain. El Escorial was built during the reign of Felipe II and designed by Juan Bautista de Toledo, who died in 1567, and completed by Juan de Herrera, as a palace and a house for Hieronymite monks. The palace library, once one of the finest in Europe, and a fine art collection, made El Escorial into a centre of intellect and learning. Felipe II died there in September 1598, and is buried in the Panteon de los Reyes, which houses the tombs of all Spanish monarchs from Charles I to Alfonso XIII.